Daylight Saving Time returns on Sunday, March 11, 2018 at 2 AM. No one knows why, but no one knows why lights go on when we flip switches either. If you cut a $20 bill in half and staple the front end onto the back end, what do you have? Right! A $20 bill that you can no longer spend. Daylight Saving Time returns on Sunday, March 11, 2018 at 2 AM. If you believed the answer was $30, you probably understand Daylight Saving Time (DST). That’s because it is based on the belief that when you cut out one hour at 2 AM in the spring, you add an hour of sunshine until autumn. Hahaha! Wait. That is what happens, isn’t it. Hmmm. One thing is for sure: Daylight Saving Time returns on Sunday, March 11th. We will either gain or lose one hour of sleep. Obviously, that means you will be one hour early for church on Sunday or one hour late for work on Monday — whether or not you change your clocks on Saturday night. Daylight Saving Time isn’t all that hard to figure out, but it’s a great excuse to show up an hour late to work on Monday. If you really get it wrong, prepare yourself to wind up at Sunday school for the first time. Good luck explaining to the teacher why you are not visiting elderly orphans in deepest, darkest Somewhereistan, as you said you usually do on Sunday mornings. Have you ever wondered why we don’t turn our stupid clocks AHEAD in the spring at 4 PM on Friday afternoons, so we could go home early? The answer? Because that would make too much sense, that’s why. And why not adjust our clocks in the fall to FALL BACK at noon on Monday? That would give us an extra hour for lunch! Our children and herds of cows wouldn’t even notice the change. 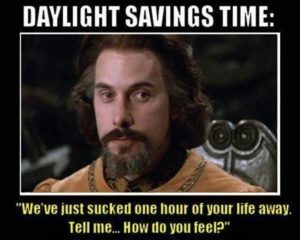 Death, taxes and Daylight Saving Time will always be with us, unfortunately. Unless you live in a state governed by The Wise who ignore DST. Those states can only afford to do so because they cut all the money they get for taxes in half and staple the front end to the back end! Voila! They doubled their revenues! Don’t ask why. Just turn your clocks ahead for the switch to Daylight Saving Time at 2 AM on Sunday, March 11, 2018. It doesn’t matter that it doesn’t make sense, even if it’s as goofy as men wearing tassel loafers.